A different standard (ASHRAE Standard 170) is used to determine required air quantity in many space types associated with healthcare facilities, and there is even a different method for calculating the required outside air quantity of an air handler. 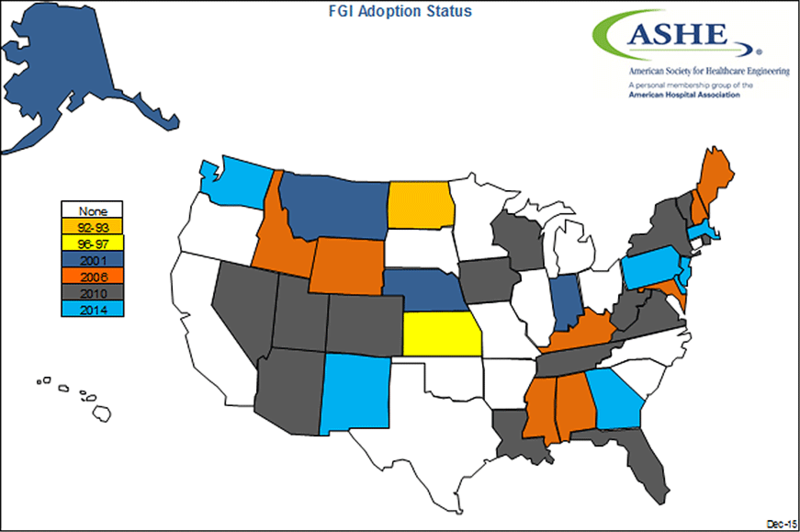 This standard is commonly adopted in states nation-wide, and also by the Facility Guidelines Institute, which many states have adopted as a standard for design and construction of healthcare facilities. Standard 170 offers opportunities to reduce energy in a couple of different ways, which we have implemented on different projects at Cx Associates. First, this standard specifies required air quantity in spaces through Air Changes per Hour (ACH). Air changes per hour is simply how many times per hour the total volume of air in a room will be “changed.” Since air quantity is referred to in cubic feet per minute (CFM) the required air quantity to provide 1 ACH can be determined by dividing the total volume of a room in cubic feet by 60 minutes. If more than 1 ACH is needed the result of that equation is simply multiplied by the number of required air changes. Example: A room that is 6,000 FT3 requires 3 ACH. The standard specifies a minimum outside air ACH, which determines the minimum quantity of outside air required for a space, and a minimum total ACH, which determines the minimum quantity of total recycled air and outside air for a space. 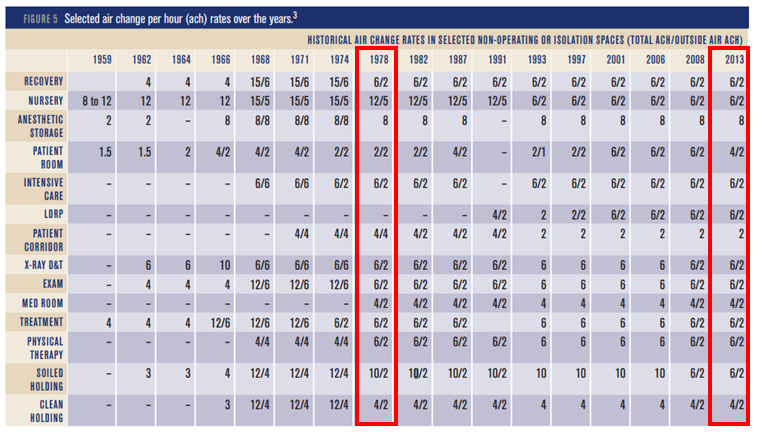 Both minimum total and outside air ACH have varied over time as shown below. If we use 1978 as an example, ACH requirements have mostly stayed the same or been reduced when compared to 2013, except for patient rooms. 1978 may sound like a long time ago, but many systems still in use at healthcare facilities today were designed at this time, and are still operating under these design specifications. Energy savings opportunities exist in fan energy savings by the total ACH value being reduced, thus AHU fan speeds can be reduced since there is no longer a need to maintain the 1978 total ACH requirement. Another opportunity exists in reduction of heating and/or cooling energy since outside air ACH requirements have been reduced. Less outside air means less energy required to condition supply air as discussed in my previous post. Of Health-Care Ventilation," English, Travis R.; ASHRAE Journal; June 2016; pp 52; Copyright 2016 ASHRAE. The second method will often result in a higher outside air quantity for the air handling system than simply the sum of the individual space requirements as specified in in the first method. Again, as described in my previous post, less outside air means less energy to heat and cool supply air. This outside air quantity can be monitored via an airflow station installed in the air handler outside air intake and the air handling system can be further optimized by controlling it following ASHRAE Guideline 36. Healthcare facilities often have much higher energy use intensities (EUI) than typical commercial buildings, but by leveraging the requirements and methods of ASHRAE 170-2013, Cx Associates has successfully reduced the energy consumption of air handlers at many hospitals throughout the region.